I think one of the reasons I am drawn to birding is the ever increasing challenge inherit in the activity. Like my other favorite pastime, running, the barrier to entry is pretty low. If you want to get started in running, all you really need to do is grab your favorite pair of sneakers, lace them on and pretty much go. Over time that gets to be easy so you think to yourself, maybe I will go further or perhaps try to go a bit faster the next time. Complete that bump in ability and next thing you know you are training for a marathon or some other crazy running related activity – wrapped up in all of this is the ongoing investment in tailored shoes, technical clothing and of course new breakthroughs in hydration and fuel. Compare that to birding. To get started, all you really need is to … well, go outside and look. There are very few places that are inhabitable, that doesn’t have at least one bird to look at if even a House Sparrow or Crow. Like Running, the desire to do more starts creeping in so you expand your circle and start acquiring a few reference books. Eventually you are planning your vacations around a particular bird and invested in some serious photography equipment. The challenge has escalated to getting a better shot of a bird or properly identifying a never seen before species. In Running and in Birding, the thrill of the accomplishment is the fuel that keeps the interest revving. Sounds impressive doesn’t it – the struggle of man vs wild, overcoming incredible obstacles to get the shot and burning the midnight oil pouring through reference books barely able to keep the lids open enough to compare your blurry image to the hand drawn reference. That may be true for some situations, but don’t be fooled, there are times like this that are embarrassingly easy. You are viewing the latest addition to my birding check list, a find from our January 2017 visit to Laguna Atascosa National Wildlife Refuge. We were visiting this refuge for the first time ever on New Year’s Day. Things started off on the right foot, finding out that there wasn’t a fee to get into the refuge that day. It didn’t take long to start checking new birds off the list (you have seen a few of them already, but there are more to come for sure). At one point along the walk, this Woodpecker showed up to hunt for insects in a nearby dead tree. 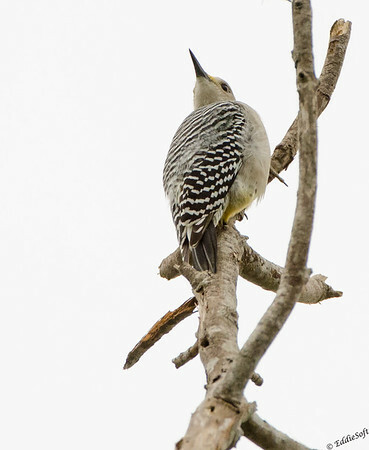 My list has a number of different Woodpeckers on it as they are fairly common at home and fairly easy to hone in on thanks to their loud jackhammering. 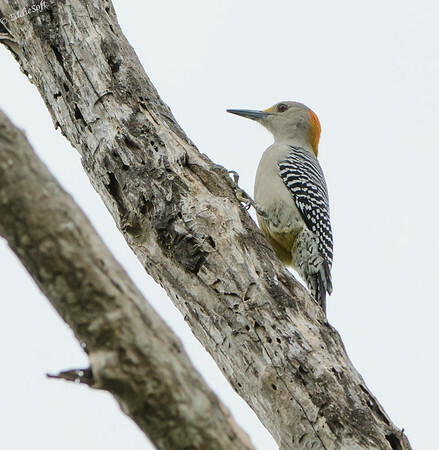 This one looked similar to the Red-Bellied Woodpecker (link here), although it was sporting more yellow-orange patch on the back of the head and a small patch of yellow at the base of the bill. 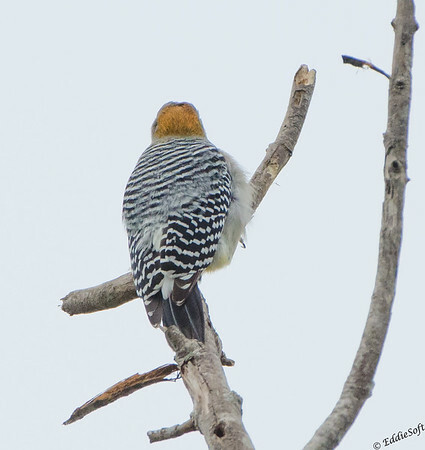 It might just be a southern variation like the Red vs Yellow shaft of the Northern Flicker. Thankfully, there was a sign next to me so I could stabilize The Beast and get a few shots into the tin. The more it remained in my focus points, the more convinced it was a new species. After deciding the bark didn’t hold any cheeseburgers, it headed off deeper into the woods leaving me to add a mental reminder to devote some time that night to getting the bird classified. It is at this point the previous comment about “embarrassingly easy” comes into play – and you thought I was just rambling at the beginning hehehe. Soon after lifting The Beast from its resting place on the sign a duh moment took hold. 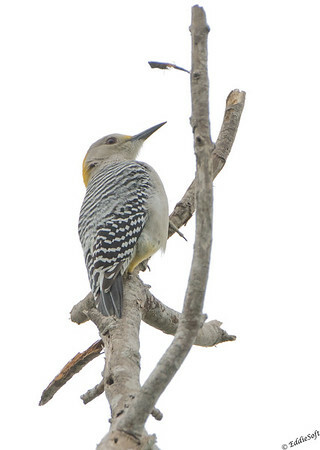 The sign announced “Golden-Fronted Woodpecker” followed by an image of the bird I had just spent time photographing. By then, Linda was walking down the path towards me. Having no shame, I cleverly put my body in front of the sign and announced with authority “I just added the Golden-Fronted Woodpecker” to my list. Response, “way to go my birding stud!” … err or at least something along those lines. No need to give all my secrets away hehehe. Kudos to the Laguna staff for nailing the perfect placement for that sign. In case you are wondering, on our recent trip I spotted another Golden while standing at the exact same spot… sign still there. You can clearly see the distinctive patch in the shot above along with the zebra pattern on the back. What you probably didn’t know is this Woodpecker shares an evolution line with the Owl. Sorry, another call from the Ministry of Truth (as my fact checking committee likes to refer to themselves as) has alerted me to a deceptive assertion. I recant my previous statement regarding the Owl lineage pending further investigation – Who Who (sorry, had to throw the old joke in) could blame me after seeing the shot above – hurts my neck just looking at it. Oh no, out of shots! A quick check of facts for this new bird. Like most of the birds over the last two months, the Golden is fairly localized to a band down through Texas and into Central America. 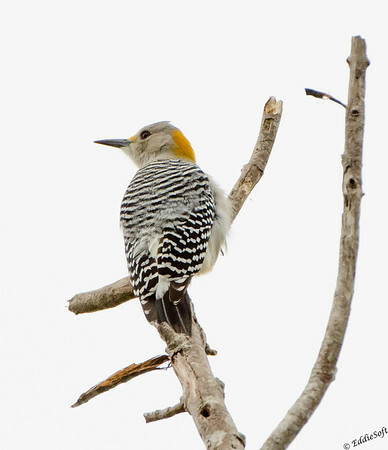 Although from the Pecker family, the Golden will consume equal amounts of fruits and nuts. Beyond that, the only interesting tidbit is the fact that our birding checklists took a hit thanks to them combining the former four species of the Golden into one – rats. Time to go folks – need to prepare for MORE snow on the way. Love how you pull your two passions together. As with any passion we start with “hey, this is cool.” and soon find we are spending crazy amounts of money and time and conversation on them. Always enjoy my morning coffee reading and learning something new from you! Thank you – I am sure this is a similar scenario with you and your kayaking (and I know you took pictures of birds before ha). Probably to a fault, I am challenge/goal driven – think is likely due to the pure adrenaline that is produced when you finally make across whatever goal line you have set for yourself. Funny about the crazy money point you made – I was thinking about this post while out on a run a few weeks ago and noted to myself just how long it took me to get to actually running – figure out what the footing conditions were to pick the appropriate shoes, check the weather against my cheat sheet to know layering equation to use, estimate the goal distance in order to figure out how much fuel to put on the belt, drive to my favorite park, stretch a bit, get the gps started and then finally run – things have sure changed from when I decided to start running 15 years ago ha! Thanks for dropping by – always appreciate your comments!